Rob Zombie thrilled fans of his films when a sequel to The Devil's Rejects was announced and quickly produced earlier this year. Though shooting has completed, the shock-rock-turned-cinematographer put Three from Hell on hold in order to go on the road with Marilyn Manson; this is the second outing for the dastardly duo, and the venture is aptly named Twins of Evil: The Second Coming Tour. The goth icons will destroy the stage at KeyBank Pavilion in Pittsburgh tonight before continuing their international reign of terror, ending in Irvine, CA on August 29th. While his filmmaking duties have taken a back seat, Zombie has nonetheless been keeping Three From Hell in the forefront of horror fans' minds. Earlier in July, he shared the first teaser trailer for the film with a live audience on one of The Second Coming Tour's first stops. Though an HD version has yet to emerge on YouTube, the Three From Hell teaser was recorded and shared by Rob Zombie himself via Instagram. In between unleashing sonic mayhem and (presumably) trashing hotel rooms and tour buses, Zombie is keeping his core supporters satiated with additional peeks at Three From Hell. 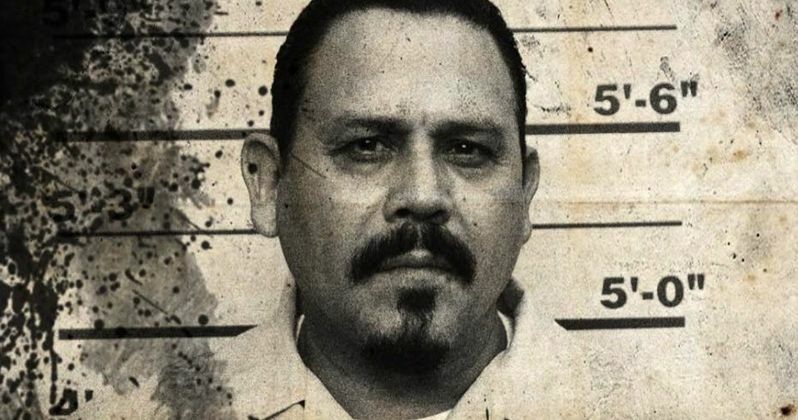 Today, he shared a pic of Sons of Anarchy player Emilio Rivera in a character poster, one that suggests he's on the wrong side of the law. It resembles previously-shared mug-shot style one-sheets that have featured Captain Spaulding (Sig Haig), and Otis Driftwood (Bill Moseley)), aka the two men in The Firefly Family who feature prominently in both The Devil's Rejects and its predecessor, House of 1,000 Corpses. (Apparently, rumors of their violent demise have been greatly exaggerated!) As opposed to the core trio, Rivera is a newcomer to Zombie's bloody franchise; we know nothing about his character (listed merely as "Actor" on IMDB), but we can assume he's one of the bad guys. In addition to the actors mentioned above, Three From Hell's sizable ensemble cast includes Danny Trejo, Kevin Jackson, Wade Williams, Jeff Daniel Phillips, Clint Howard, Pancho Moler, Daniel Roebuck, David Ury, Sean Whalen, Austin Stoker, Dee Wallace, Richard Brake, Bill Oberst Jr., Richard Riehle, Dot-Marie Jones, and Tom Papa. In addition to a real trailer, we're waiting for an official release date, though Zombie promises we'll see Three From Hell sometime in 2019. If you're more interested in The Second Coming than Three From Hell, you can check out remaining tour dates below the trailer for The Devil's Rejects.